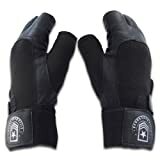 These Weight Lifting Gloves Will Improve Your Performance In The Gym, Eliminate Damage To Your Hands And Help You To Lift More Weight – Guaranteed!Weight lifting can be a very demanding sport on the hands and wrists, over time you can expect to see calluses, blisters and a build up of dry patches of skin all over your palms. Without wearing good quality weight lifting gloves, the regular gripping of dumbbells, barbells and machine handles can damage your hands.But one of the biggest problems that many weight training enthusiasts face is not being able to lift more weight because of pain and discomfort in the wrists and palms of the hand – this slows down progress. However the solution is simple – Soft leather fingerless lifting gloves with wrist wraps and padded palm from Elite Body Squad.Our gym gloves will give you… * Maximum comfort – soft leather that moulds naturally to the shape of your hands * Protection, control and superior grip for all types of weight training, bodybuilding and weight lifting exercises * A handy finger tab which makes removal quick and easy. Focus on lifting weights not the pain and soreness you feel in your hands. You want to lift more weight for more reps, if your hands are holding you back, you need support and protection. We feel these weightlifting gloves are the best on the market by far and stand behind them 110%! Our leather weight lifting gloves come in a range of sizes. To check your size, see the image above left. Your Quality Guarantee – If you are not 100% happy with these workout gloves, you can return them unused for a no-hassle replacement or full money back Guarantee! Click the “Add To Basket” button NOW (top right) to give your workouts a boost and protect your hands from training abrasion, completely risk free!